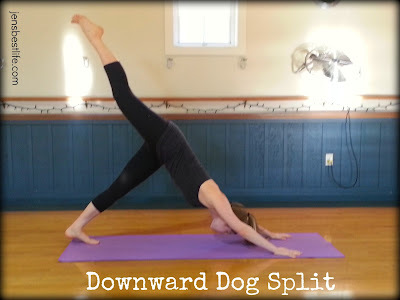 One of the things I wanted to do while I was visiting my family was create a yoga flow for runners. 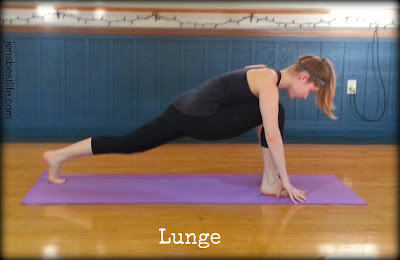 I wanted something that would both stretch the right muscles—hamstrings, quads, hips, calves—while also strengthening them, and I didn’t want it to be too long because it’s so hard to practice yoga at home (or at least I think it is!). Luckily, I have a yoga teacher I can talk to at home! My dad teaches yoga four to five times a week and is a Yoga Alliance certified instructor. He’s prepping a teacher training for this summer because there are so few certified yoga teachers in my area. Once I gave him the things I was looking for, he put together a series of poses to meet my specifications! We spent an hour or so on Saturday taking pictures to illustrate the poses. Then, I used the descriptions from my dad’s yoga book for each pose. Oh yes, I forgot to mention that. My dad wrote an entire book on yoga filled with poses, descriptions, and other yoga tidbits. He generously let me use his book descriptions to explain what to do as you move through these poses. The book is available on Amazon if you’re interested! Anyway, I’m so excited to share this yoga flow with you! It’s my first time acting as a fitness “model,” and my camera didn’t always take the best shots, but hopefully you can get a good enough idea of each pose and the movement between them. 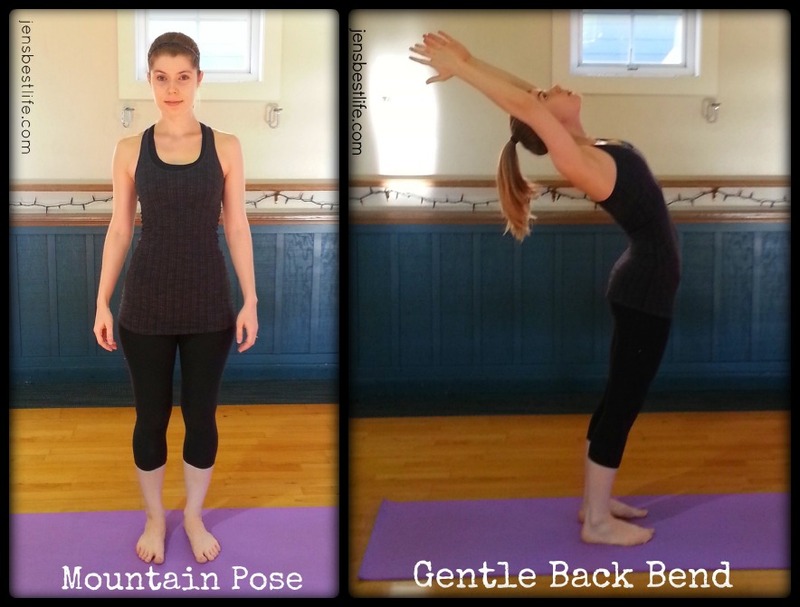 If you are familiar with yoga poses, you can just use the photos as a visual guide for the flow. If not, there are in-depth descriptions of each pose to help you figure out alignment and how to get in and out of each pose. This is a great series to use not just for a yoga flow, but for a pre-run warm-up because it builds heat and stretches your entire body, limbering you up before you head out. From Mountain, gently bend backwards for Gentle Back Bend. Stretch long and look at the ceiling. Since you are just starting to warm up, only bend gently back, with more emphasis on lifting your rib cage and stretching your front than bending your back. After bending backwards, exhale through a swan dive (arms extended out to both sides) to Forward Fold, bending from the hips, not the waist. Once folded, relax your neck and look at your knees. 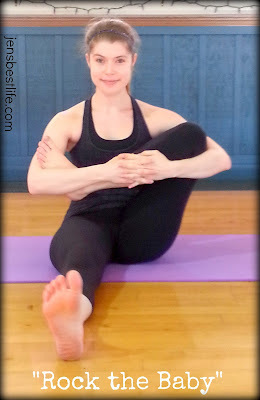 If you have very tight hamstrings or lower back problems, soften or slightly bend your knees. Keep your abdomen lifted and your spine long as you fold forward. Touch the floor with your fingertips if you can. Never force here -- you should feel your hamstrings gently stretching, but you should not feel any discomfort in your lower back. If you do, back off and bend your knees. 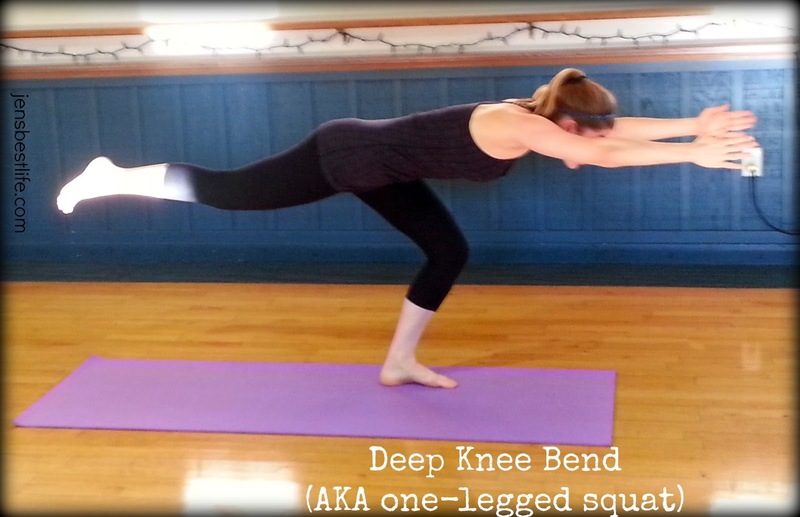 your hands on your knees or shins for Forward Arch. Keep your neck long as you look at the floor. Feel your back extend and your hamstrings stretch. 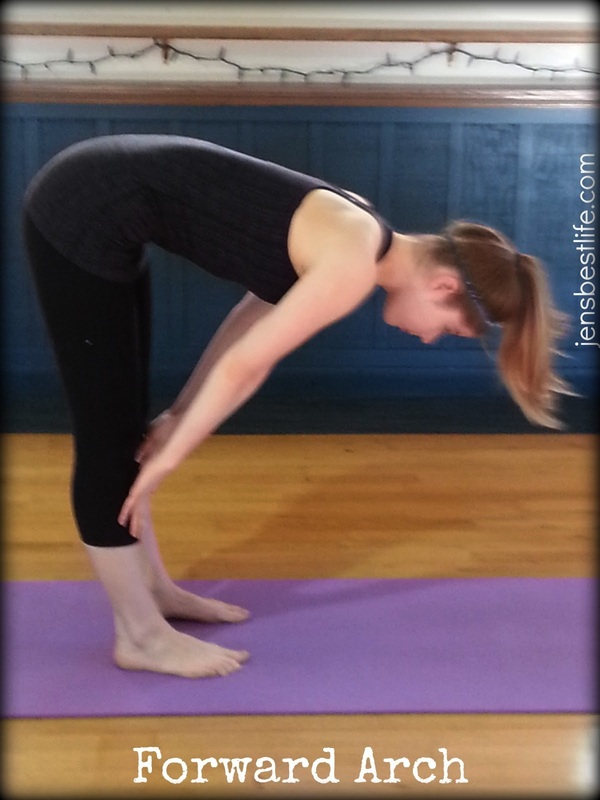 Roll your shoulders back and down as you extend your spine. Rotate your pelvis so that your tailbone and your lower back are on the same plane, making one long line from the tip of your tailbone to the top of your head. Broaden your shoulders making space between your ears and your shoulders. Exhale your right foot back to Lunge -- keep your left foot flat on the floor with your left knee directly over your ankle and your finger tips on the floor. If it is too difficult to hold this position, you can lower your right knee to the floor. Keep your hips low and straighten your right leg. Roll your shoulders back, lift your chest, and look forward. Try to make a long straight line from your forehead to your right heel. 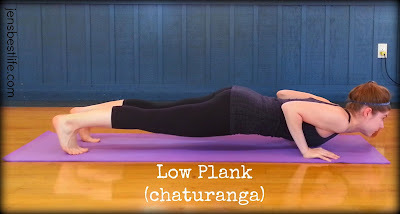 Inhale your left foot back next to and hip width apart from your right foot for Plank. If this is too difficult, lower your knees to the floor. Your hands should be flat on the floor with spread fingers beneath your shoulders. Make a long straight line from the top of your head to your heels (or from the top of your head to the end of your tailbone if you lowered your knees). Looking at the floor, lengthen your arms without locking your elbows, make space between your shoulders and your ears, and broaden your chest and shoulders keeping your abdomen lifted in and up. Make sure that your seat is not sagging or too high -- you need to be one long straight line. 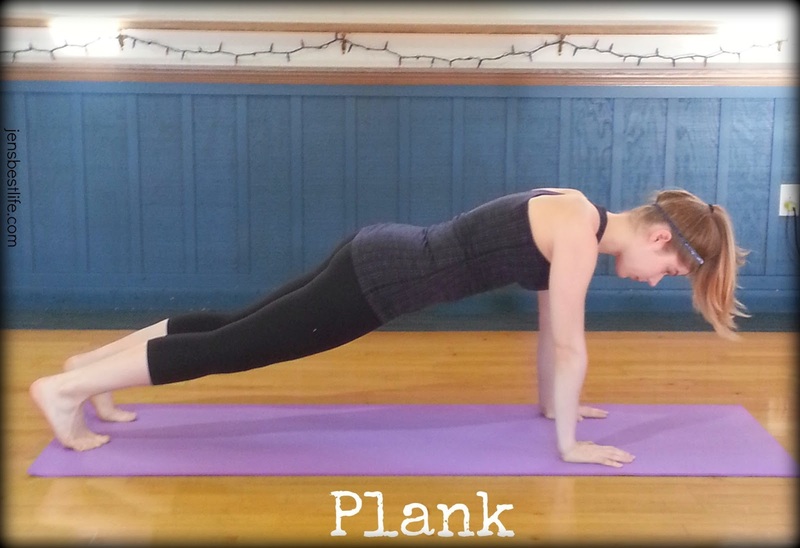 Exhale, lowering your body to a low push-up position for Low Plank (the infamous yoga push-up). Keep your elbows right next to your ribs, trying not to let your body touch the floor. 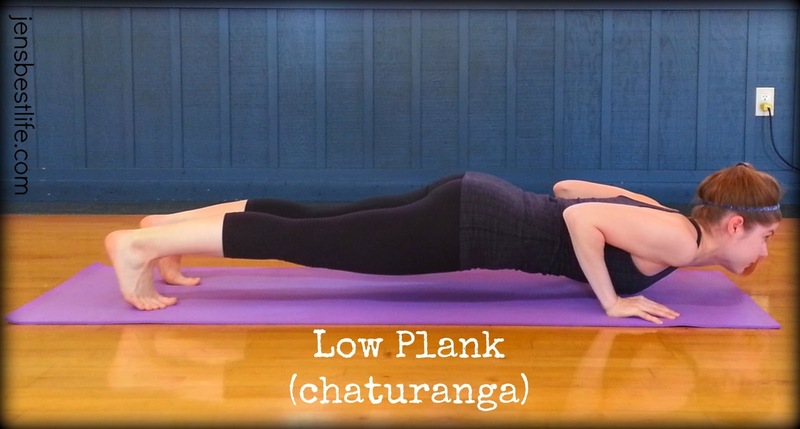 Your entire body should remain in exactly the same position as Plank (including knees on floor if needed) except that you have bent your elbows to lower yourself. Inhale your upper body upwards as you move from your toes to the top of your feet for Upward Dog. Reach long with your arms, roll your shoulders back, lift your chest, and look forward. If you can lift your legs off the floor, do so. Exhale your weight back to the balls of your feet, straighten your legs without locking knees, and move your seat up and back for Downward Dog. If straightening your legs is too difficult or painful, bent knees are fine. Try to get your weight centered more on your legs than your arms. Lift your sitting bones, extend your arms, and broaden your chest, lifting your abdomen in and up towards your spine. Your hands should be three to four feet from your feet, depending on the relative length of your torso, arms, and legs. Relax your neck while looking between your feet. Try to move your upper body down and back without moving your hands, making an upside down letter “V”. Lower your heels. Getting your heels to the floor is not the point of this pose and is not possible for everyone -- it's more important to try to get your sitting bones up high and a long straight line from the top of your head to the bottom of your tailbone. Raise your right leg up, activating your glutes, for Downward Dog Split. Try to keep your hips level and squared to the floor with your left heel as close to the ground as it was before. 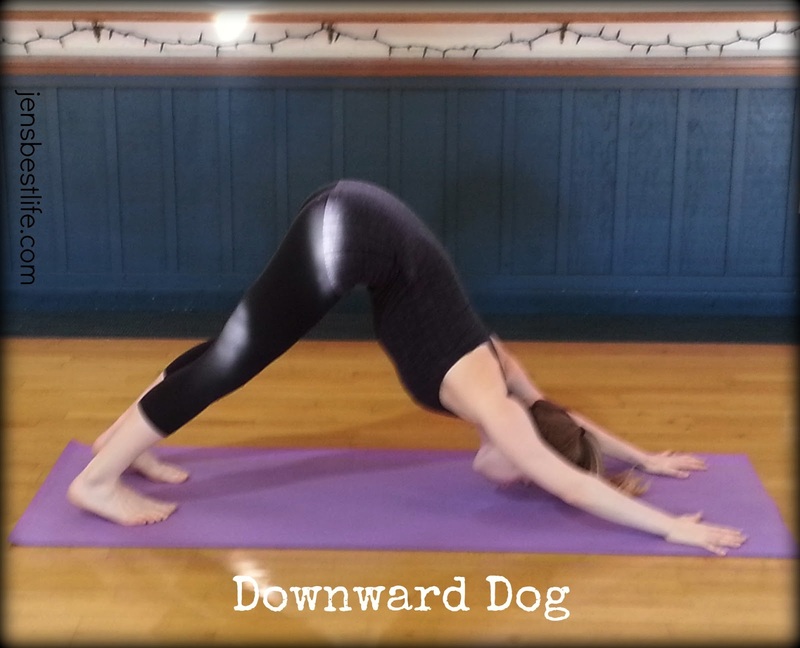 Keep your alignment from Downward Dog, making a straight line from your hands through to the tip of your foot. 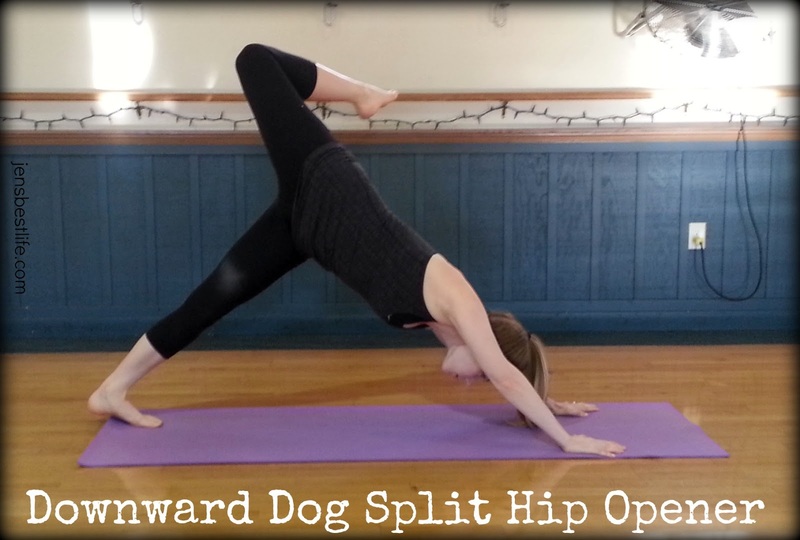 Bend your right leg and tilt the heel back toward your right glute, stacking your hips, for Downward Dog Split Hip Opener. Try to keep your chest from rotating outwards. Inhale your right foot forward for Lunge, repeating as before. 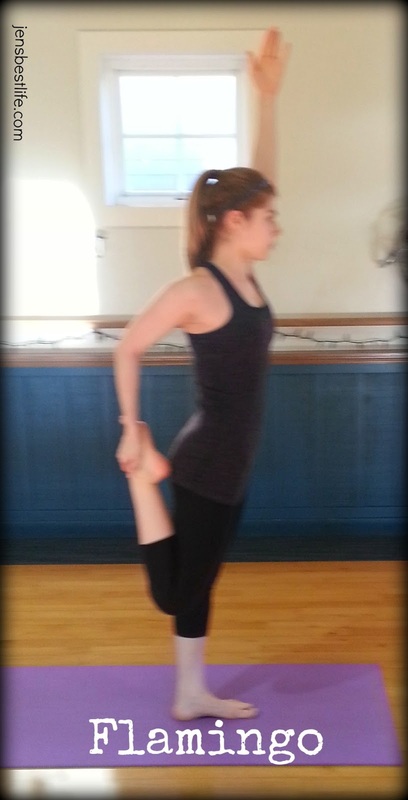 Exhale your left foot forward for Forward Fold, repeating as before. elbows, and facing palms for Chair. Look forward while lowering your hips and stretching your arms up. Keep both feet flat on the floor and your shoulders and neck relaxed. Breathe. You may want to stay for several breaths in this pose. For added difficulty, raise up onto the balls of your feet to engage your calves in Chair Modification. Do not let your seat rise; keep the same alignment as in Chair. Rise back up to Mountain. Repeat the Vinyasa series multiple times at an increased pace to add a cardio element, or hold each pose for 3-5 breaths for an increased strength workout. Flow through the Vinyasa series through Downward Dog. Each pose here should be held for 3-5 deep breaths in order to get the full stretching and strengthening benefit. Only one side is pictured -- make sure to repeat on the other leg! 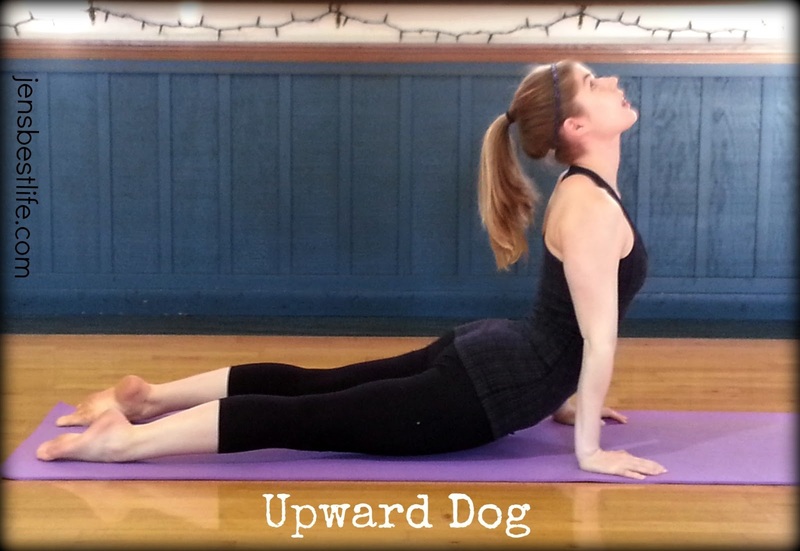 From Down Dog, look forward and inhale your left foot next to left hand. Extend your arms straight forward with your biceps next to your ears and your palms facing each other. Stretch long from your tailbone to your finger tips, then inhale your torso up to perpendicular, keeping your biceps next to your ears, for High Lunge. Keep your hips down, your back leg and spine straight, and your right knee directly over your right ankle. You may turn your back foot to 45 degrees or stay on the ball of your back foot. (If this is too difficult, lower your back knee to the floor). Whichever variation you choose, your back foot should be hip width from your front foot and your hips squared facing straight forward. Lower your hips as you lift your ears. Relax your shoulders as you send energy up your extended arms. Keep your biceps next to your ears. 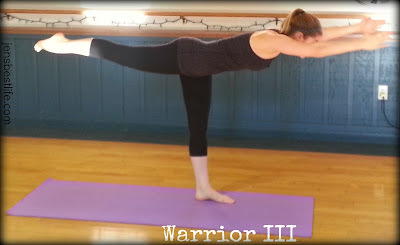 Inhale to standing on your front leg with extended arms and biceps next to your ears, then exhale as you slowly bend forward from your hips, not your waist, for Warrior III. Your back leg should be straight with your foot slightly off the floor, while your front foot and knee should be facing forward, so that you are reaching in both directions. Reach long from your finger tips to the ball of your back foot. Lift your front knee and thigh, but don’t lock your knee. Keep a long straight line from your finger tips to the ball of your back foot, making sure that your hips stay level. If balancing is too difficult, you can extend your arms to your sides like airplane wings or use a wall to help balance. Although the full pose makes a letter “T”, go only as far as you can maintain both your breathing and your form. While in Warrior III (or "Airplane"), bend your standing leg for a Deep Knee Bend. Repeat 5 times if possible for 5 one-legged squats. Return to Warrior III, then High Lunge, then Lunge. Flow through the Vinyasa series. Repeat on other leg. slightly angled, feet hip width apart, and hips squared facing forward. Inhale your arms overhead with straight arms, palms touching, and thumbs crossed. Keeping both legs and arms straight, but not locked, slowly curl forward as you exhale until your forehead touches your front knee for Standing Forward Bend. Go only as far as you can without any strain on your lower back. Touch your fingertips to the floor in front of your foot (Option 1). If you need to separate your hands for balance, do so (Option 2). Alternatively, exhale your arms into prayer hands behind your back, rolling your shoulders back, before bending (Option 3). If you cannot make prayer hands behind yourself, grab your elbows or forearms. From Mountain, exhale your right hand down as you lift your right foot behind yourself. Grab the inside of your right foot with your right hand, pulling until you feel a stretch. Keep your left arm and leg extended for Flamingo. Stand tall. knee as high as possible for Dancer. The more you reach forward and kick back at the same time, the better you can balance. Make sure that your upper leg does not angle outwards. Focus your eyes straight ahead on something that doesn’t move. Flow through Vinyasa series from Mountain to Lunge. 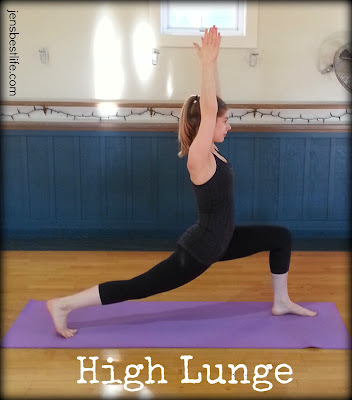 Inhale as you lower your right knee and the top of your foot to the floor. 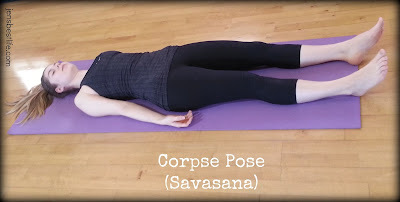 Exhale your hands flat on the floor to the inside of your left foot and lower your upper body forward until both elbows (or hands if elbows don’t reach) are on the floor for Lizard. If you can, reach your left arm back and grab your right foot for a Quad Stretch Modification. After several breaths, sit back and straighten your left leg, bending over it for a Hamstring Stretch. 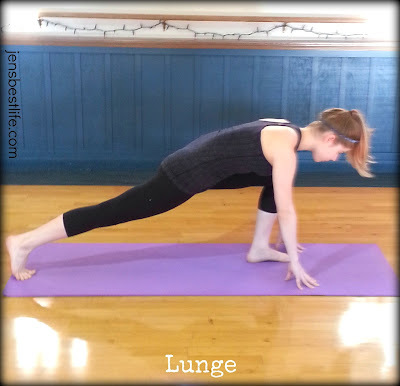 Return to Lunge, then flow through Vinyasa series and repeat on other side. on top of your right knee. Place the sole of your left foot on the inside of your right elbow. Reach your left arm around the outside of your left knee and interlace your fingers for Rock the Baby (ok, also known as Akarna Dhanurasana, but try saying that three times fast). Sit up tall and straight and hug your leg to your torso. seat. Place your left foot on the right side of your right knee. Your left knee will now point towards the ceiling. Sit up as tall as you can. Place your left hand next to your tailbone, fingers facing away, and your left arm around your right knee and hug your thigh to your torso for Sitting Twist. Inhale tall then exhale your abdomen to the right. Inhale tall then exhale your chest to the right. 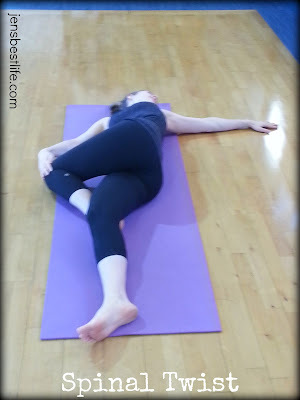 Lie on your back and extend your left arm, palm facing down. Place the palm of your right hand on the outside of your left knee and slowly exhale your bent left knee over to your right side. 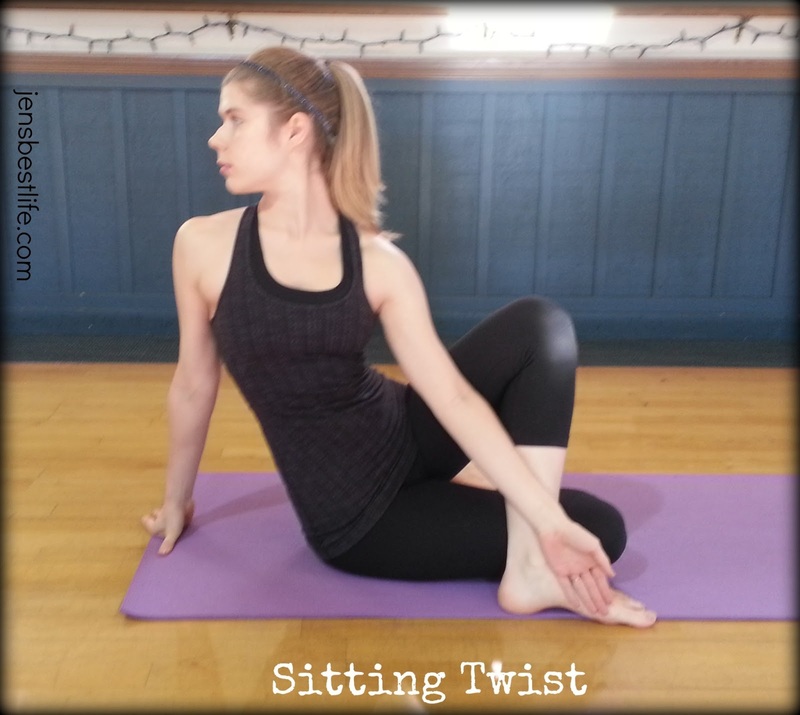 Keep your right leg straight and your left shoulder on the floor for Spinal Twist. Your left foot should be resting on the side of your right knee Fig 106. Do not push your left knee to the floor, let gravity slowly bring it to the floor. Yoga joke! 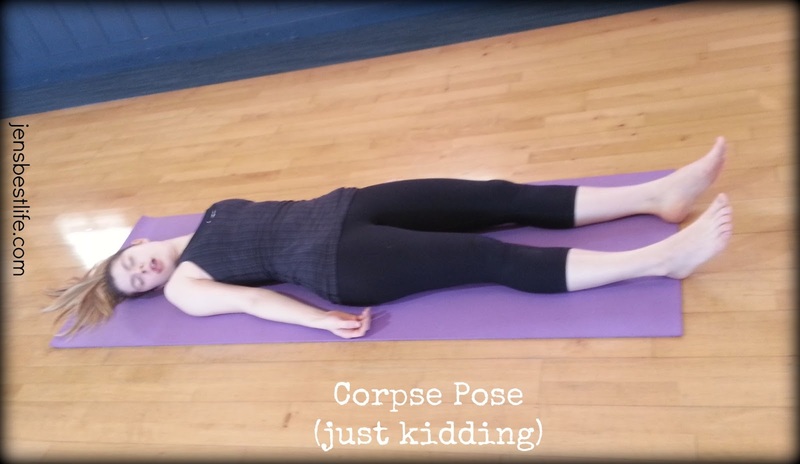 Because it's called corpse pose! So I'm acting like I'm dead! *crickets* ... ok, moving on. with your palms facing up and your feet should be hip width apart. Breathe deeply for 3-5 minutes here. Close your eyes and melt into your mat. If you're a runner, do you also practice yoga? 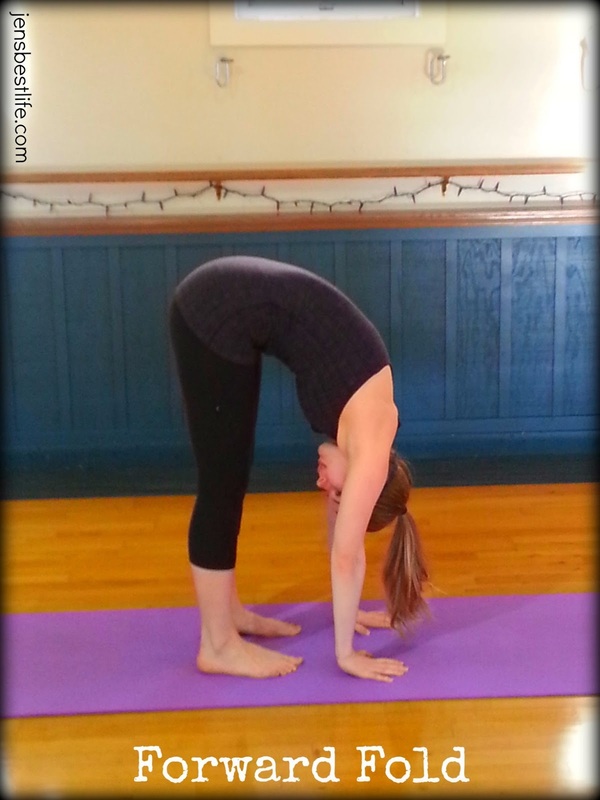 Would you like to see a core-strengthening yoga flow? LOVE this, thank you! I always need more yoga in my life. My poor hips could use it. And how awesome to have your dad as an instructor. My sister is recently certified but hasn't shared her knowledge! My hips are super tight so that might be why there are so many hip openers ;) I definitely need more yoga in my life, it's the first thing I leave off my schedule when I'm busy. Trying to change that! Jen, your dad is awesome. Just saying. And you were an awesome model! Under Armor and Nike is next!! I'm going to have to add "Rock the baby" to my routine, I have never seen this before. But I always stretch/do yoga after a run. My body would kill me if I didn't. I started my practice to build strength and cross train, and have not looked back since. Please please PLEASE share a core sequence. That would ROCK my world. Ok a core sequence is now on my list of to-do posts :) And thanks!! It was really fun although it got hard to hold some of the poses. Rock the Baby is a great hip opener, I highly recommend it. I have tight hips so I try to do as many hip openers as possible! This is really great. Thanks so much for posting this!!! Hope it's useful! Thanks for reading, Kristin! Aw, that's so sweet. Thanks, Carrie! This is so fantastic, Jen! And holy moly, you are one bendy lady. :) I'm going to use this tomorrow... really feeling the need for some yoga! Your first corpse pose picture made me laugh, even without the explanation, lol. Seriously though, awesome series of photos and poses. I know yoga's good for you, and I should probably do more of it. 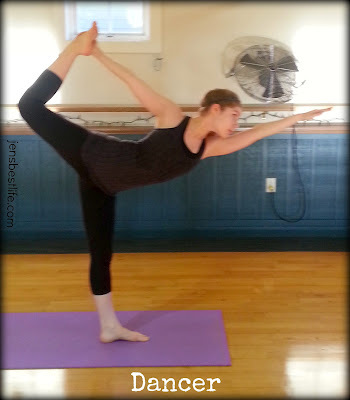 I tried a few self-taught poses when I started running and it helped me...especially strengthening in my lower back. Yoga is great for core and back strength! I'm actually going to be doing another flow soon for the core! 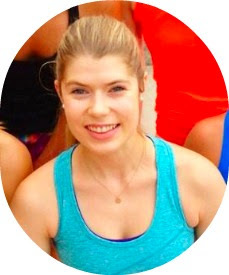 Just found your blog - and I am so glad I did! Thanks for reading!! Hope it's helpful! Hi thank you for this post it is very helpful. I tried a yoga class in my area and enjoyed it however I stopped going because certain positions would cause my legs to go into spams or I for some reason could not get into them. For instance the DOWN DOG SPLIT. It felt really great on one side and when I went to the next leg I literally could not raise my leg up to get it into position. Will doing the series of positions as you have them posted here help that? thanks for all you do! Hi Frances! I'm not sure a specific sequence will help you -- rather, I would show a certified teacher the poses that cause the spasms and see if they can provide adjustments that help. If they can't, then don't do them! There should hopefully still be plenty of yoga poses that still work for you!